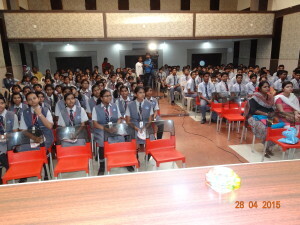 IPSPI (Indian Patients Society for Primary Immunodeficiency) observed the Global Launch of World PI Week at Venkateswar School, Near Infosys, Bhubaneswar, Odisha, India, with a KIDS DAY event. The school children did a Fancy Dress on the theme Unity in Diversity with the children dressed as South Indians, Punjabis, Kashmiri, Farmer, Odia, Sikh, etc, representing different religions and Indian states. It was a wonderful event. 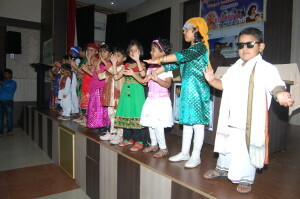 IPSPI distributed pamphlets on 10 warning signs to students and teachers and staff and small gifts given to the children participating in the Fancy Dress. During the event we released JMF WPIW Balloons on the play-ground, a moment of great fun to all, followed by snack meal. Inauguration of this event was done by lighting the lamp by Chief Guest, Sh. Chandrasekhar Pati, Chairman and Principal of Venkateswar School accompanied by several Guests of Honor. 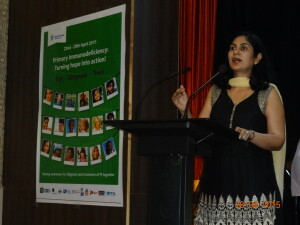 Dr Rashmi Ranjan Das, Assistant Professor, Department of Pediatrics, All India Institute of Medical Sciences (AIIMS), Bhubaneswar, Odisha, Dr. Madhusudan, Assistant Professor, Dept. of Pediatrics, (AIIMS), Bhubaneswar, Odisha, Dr Sambit Behera, Senior Resident, Department of Clinical Hematology, SCB Medical College and Hospital, Cuttack, Odisha, Secretary and the Vice-Principal of the School.